A group of City students have attracted interest from the international academic community with their research projects on autism. The students attended the International Society for Autism Research Annual Meeting, where they presented their research findings on memory and anxiety in people with autism. Sara Pisani (BSc Psychology, 2016), was invited to give a talk about her final year honors research project on memory in autism at the conference. 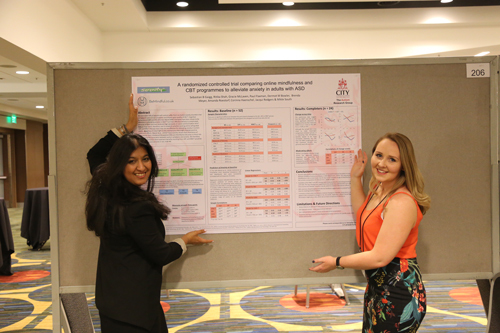 Gracie McLaven and Ritika Shah (MSc Clinical Social and Cognitive Neuroscience, 2017) presented a poster on anxiety in autism. Their poster attracted so much interest that they were also asked to give a short talk the following day at a Special Interest Group meeting on the topic. Sara Pisani’s final year project looked at how prior knowledge influences memory and ongoing perception in individuals with autism. Sara’s experiment measured how autistic individuals perceive and recall the sizes of objects that were either very familiar to them (fruits or vegetables), or not familiar at all (random shapes). Her findings suggested that prior experiences with objects affect the accuracy of long-term memories of these objects but that this does not impact the ability to remember them in the short term. 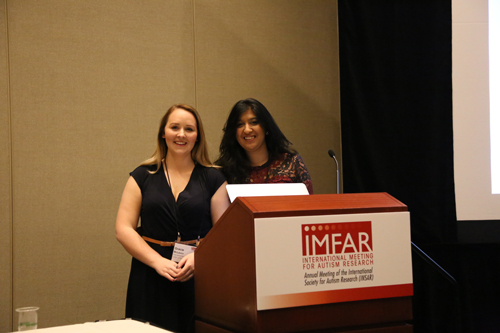 It is incredibly rare for an undergraduate student to be chosen to present their research at an international conference such as IMFAR, which was attended by over two thousand autism researchers from across the world. Sara’s work was very innovative and well-received at the conference and we are very proud to be fostering such talent at in our department. Anxiety disorders are around five times more common in people with autism than in the general population. The causes for this remain poorly understood and it is unclear how best to support autistic individuals with these difficulties. Gracie and Ritika’s research aimed to examine whether online psychological therapies can help to alleviate anxiety in people with ASD. The results of their ongoing trial suggest that they can. Gracie and Ritika found that autistic adults who followed either a 6-week mindfulness based therapy programme, or a six-week cognitive behavioural therapy programme, showed significantly reduced levels of anxiety and significant improvements in mental health over a six month period. The project started life as a Masters thesis under the supervision of Dr Sebastian Gaigg, who remains impressed by the dedication and commitment Gracie and Ritika have shown in this work. IMFAR is the world’s largest conference on research into Autism Spectrum Disorder. To be selected to present at this prestigious event is rare – only 10 per cent of submissions are selected as oral presentations. It was therefore notable for two separate student projects from City to be selected. This year’s event took place in San Francisco and was attended by more than 2,000 experts from around the world. During the event, students took part in workshops on how to proceed in a career in psychology and networked with PhD students and members from autism charities and research organisations. The environment was incredibly stimulating and discussing current topics in autism with world-class researchers helped me to broaden my horizons and knowledge on this research area. I went to some really interesting lectures, learnt about amazing research and felt really lucky to be there. As the conference came to a close, I realised I had engaged with some incredible people and I’m really grateful I had the opportunity to experience this.